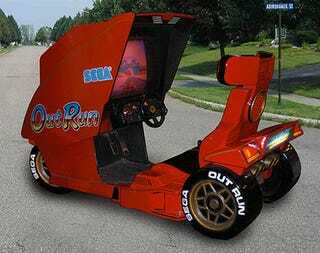 Garnet Hertz of the Pasadena Art Center College of Design is installing wheels, motors, and other equipment necessary to turn an OutRun arcade cabinet into an actual running car that renders on-screen what's happening in real life using GPS sensors. Though the cabinet itself is modeled after a Ferrari Testarossa, it'll be built on top of an EVT America Electric Trike with electric motors. The GPS sensors from an iPhone will be combined with custom software to spit out a "map" on the arcade screen in an OutRun style. Of course, since this is highly dangerous it'll only be used in a controlled environment and not just out on the street. You can get a sense for how it works in the video below. We look forward to seeing this incredible death trap on the street.